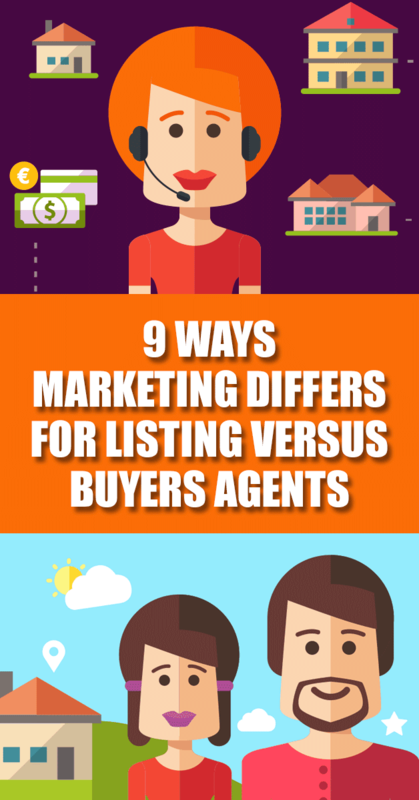 Today’s Real Estate Marketing post is about the difference between marketing for Listing Agents versus Buyers Agents! 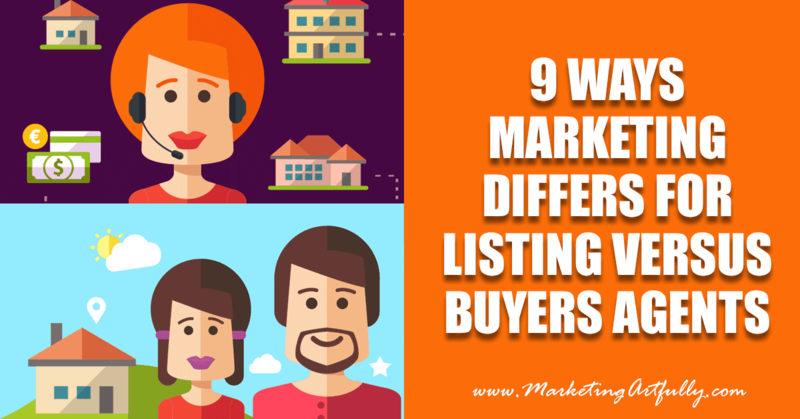 To the average consumer all real estate agents look alike, but those of us in the know should be aware that marketing for listing agents is VERY different than marketing for buyers agents! It is funny, I get a LOT of questions from companies who want to sell to real estate agents. It seems like they wake up one morning and decide to target the real estate market without understanding that there is a difference between prospecting for buyers and sellers… a rather HUGE difference! Today I am going to break down some of the common ways that real estate agents are marketing today and how they should be utilizing these channels depending on whether they are primarily a listing agent or a buyers agent. I KNOW, there are many agents that perform both of those functions often, acting as both a buyers agent and a listing agent, BUT we are just talking about marketing today and if you are trying to capture both buyers and sellers in your marketing you may be looking a little schizophrenic to the marketplace. Pick one or the other for each channel! For this post, picking a niche can include things like farming and choosing demographic targets that are easy to target. As a listing agent, you do have multiple niches that you can pick beyond just farming a neighborhood. You could specialize in ranches or farms, waterfront or mountain view, listing only luxury homes or becoming a commercial expert. But at the heart of it is the old saw, buyers buy houses, sellers buy marketing. You need to make sure that your target niche knows that you are the expert and that they see your marketing messages often. Buyers agents have a great ability to be chameleons without anyone noticing. They can advertise for first time home buyers by sending postcards into apartment complexes, target the 55+ community by advertising in local magazines and court luxury buyers by holding lavish open houses at high end properties. For a buyers agent, you need to remember that you will be spending A LOT of time with these people and need to make sure you pick a niche of people you love. Yeah, first time home buyers are great, but if you get mad when people want to look at 80 houses and then have to have their Moms, Uncle Bill and the rest of the family sign off, you might want to pick a different niche! I wrote a whole post about 5 Website Killing Mistakes Real Estate Agents Make, if you would like more info on this topic! Stop the madness now! That huge “search for homes” box that is on almost every real estate agent’s website is prospecting for buyers not sellers. Website designers are not real estate agents and don’t understand how to prospect for sellers. 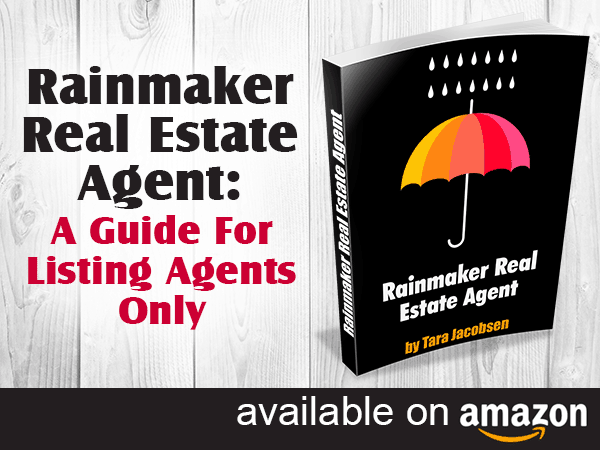 Instead offer guides and reports on the real estate market. Write posts about neighborhoods and do video tours that you have on a neighborhood page of your website. Most real estate websites are designed for you! YAY! But you can amp this up by having special pages targeting your niches and their special needs. Write blog posts about how to make sure your luxury home is perfect for your family’s needs or 3 things a first time home buyer needs to be aware of. I KNOW, everyone says postcards are dead, except the agents who are raking in the business because everyone else has ceded the field! Postcards are an amazing tool for listing agents. You can target a neighborhood and then just “introduce” yourself to them over and over again. That old saying that someone has to see your marketing 7 times before noticing it is true, especially in today’s cluttered world. You should also be mailing your database frequently. It is a relatively low cost way to keep your name and brand top of mind to people who already know like and trust you! You should be mailing into apartment complexes starting now. There are high end ones that have potential home buyers as well as mid and low priced ones that have first time buyers. You should also mail into neighborhoods that have your niche buyers. If you love selling ranches, mail into neighborhoods with riding trails. Love selling waterfront, mail into the neighborhoods that are close to the water but with no water views. Think about those move up buyers whose kids are leaving middle school and starting high school soon. Do you have a great high school in your area? Mail into neighborhoods that don’t have a great high school and see if they want to move. 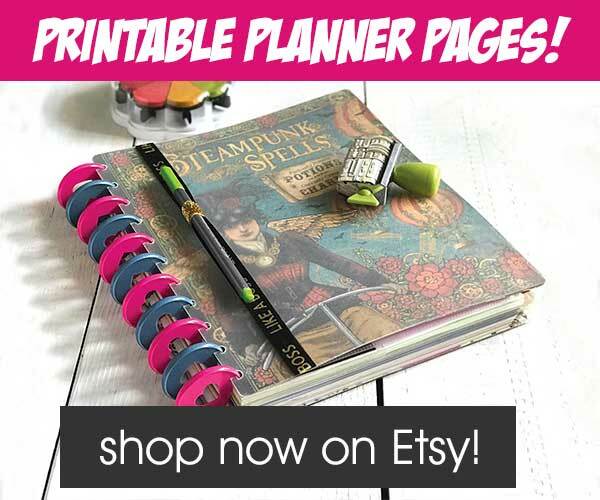 Get creative with your mailings! It is amazing how many buyers still say they found their agents “driving around”. According to the most recent NAR home buyers statistics on where buyers come from, 9% of buyers came from yard signs. That is a crazy high number for something that most real estate agents have access to easily. Yard signs can sometimes seem like necessary evil. You have to have “normal ones” for some neighborhoods, special ones for different neighborhoods and they are functionally useless in condos! And don’t even get me started on brochure boxes, except that they are a great tool for getting your listings into the hands of those nosy neighbors. Put a list of your other listings on the back as well as a seller marketing message and you just made that worthless piece of paper a super strong marketing message. Here is one that is going to blow your mind! I think you should put up a “Just Sold” sign in the yard for two weeks on every home you sell where the buyers don’t mind. Yep, I said it! Why not ask your buyers (who love you at this point) to allow you to put up a yard sign that shows you are able to bring buyers to a neighborhood. Think of what would happen if you paired that with a targeted mailing to the closest 200 homes. Let them know you “have the buyers” and that you would like to help them sell their home too! 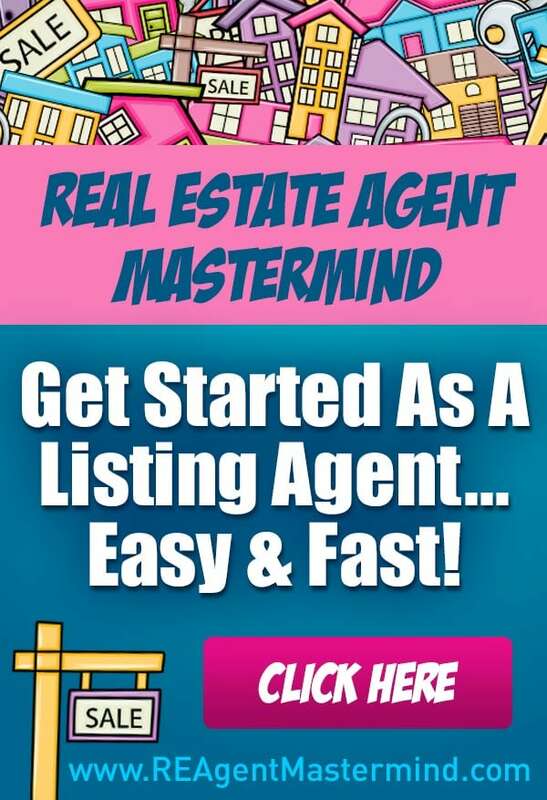 If you don’t do listings, refer that lead out to a trusted agent! I REALLY think open houses are an overlooked in today’s real estate marketing. They are not boring and pointless but a way to get in front of people who are thinking of buying or selling homes! Okay, I KNOW you are going to say your area is different, but when I was doing open houses I had 40% of listings come from them. I stalked the “nosy neighbors”, shook hands and invited them to neighbors only open houses. Not only was that free marketing, but it was personal and effective! When a listing agent is sitting in an open house, the conversation is much different than when a buyers agent is there. You could ask whether they have a house to sell before they can buy, if they live in the neighborhood or know anyone who wants to move here. How cool would it be to send in a postcard that says you have a buyer looking for listings? Yes, you have a responsibility to try and sell the home you are sitting at, but NO that is not your only goal at an open house. You should be meeting neighbors too, getting contact information for EVERY open house guest and doing video walkthroughs of the home you are holding open. This should be a super interactive way of keeping in touch with your buyers too. Invite your current buyers to come visit you, send them an email letting them know you will be there and make sure you are maximizing every opportunity to “touch” them. I LOVE brokers open houses. For those of you who do not know, this is when you have a listing open for other agents to come see. Often times it is progressive and has multiple houses in the same area open! This is a great way to build your relationships with buyers agents from other companies. Make sure you are inviting other agents to come personally. Call ones that you have done a deal with before and start an email database of every agent who walks through the door. While it is great to “double dip” your listings, more than likely another agent will be selling most of your listings so having great relationships with other agents is key. Then make sure you are working with the other agents who have listings around yours! You should attend EVERY brokers open available. Take videos of the houses you visit to show to buyers AND to post on the social media channels. Learn everything you can about the subdivisions where the homes are open and write blog posts sharing that information. Make friends with listing agents. Often times they have “pocket listings” or “coming soon” listings that are not public knowledge but you might hear about early if you are friendly with them. 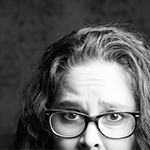 Oh networking, if not done right, it can be a huge time waster. If done well what a great asset to your marketing efforts. Networking should be business like as most people at networking will not be super helpful to you. Yes, you might get a lead from time to about a listing, but mostly you should be laser focused on people in your industry who can help your business! Make sure you are connecting with title company reps, mortgage brokers, home inspectors, builders, handymen, HVAC guys. Functionally anyone who has anything to do with a house. Start an email list of these people and make it your personal mission to keep them up on the real estate market. I KNOW, most of them will have a real estate agent or two they already work with, but networking is a long game that you will have to grow and nurture over time. Most buyers agents I know are at least a little social. They like people and so networking can really be a way to broaden their sphere. That said, you need to be very deliberate about what you are doing with all those new connections you are making. Yes, do the one-on-ones, but make sure to follow up with regular communications. Yes, go to the meeting every week, but don’t get stuck in rut with your elevator speech. Make sure you are talking about the market as professional. Tell real stories about your clients and ask the other networkers if they know anyone who you could help. Please know that you are probably not going to do an ad and pick up 40 listings a day like many of the Facebook ads say. That said, you can definitely make a huge impact with Facebook ads. First off, upload your current database and target ads to them. Talk about your real estate expertise and always mention that you are available to answer any questions. Use “similar audience” Facebook ads to get more people into your database with other ads. Understand that you are generally going to have to use some kind of “sales funnel” to work people down from generally all Facebook people to ones that could or will use your services. You need to really narrow your niche down in your ads. You should be able to target on two levels, geographically and by interest. So you target your zip code and people getting engaged. Then make an ad that talks about “making a home” and “taking next steps”. Run those throughout the engagement process, possibly even giving them tips about their marriage instead of trying to sell them a home. Get them to sign up for a first time homebuyers email list and then drip one them! There are all different kinds of these niches and channels that you can target if you get creative with your marketing! If you read nothing else, read this! Your database is the most important asset your business has and should be treated as such. Most agents use their database as just a huge storage device for names. But you won’t do that! Instead you will make sure to have lots of different categories of people. Sellers (current, past and potential), buyers (current, past and potential), industry people (mortgage brokers, service people, other agents) and then your sphere of influence. You should be contacting everyone in your database once a week minimum. This could be a weekly message, sending out your most recent blog post or even sending a video update of what is going on in real estate this week. When you have a listing you should email everyone with a “Just Listed” message. It is funny how much people like seeing those! Make them fun and interesting, including things that you might not be able to say publicly in the MLS. Send neighborhood statistics when possible. If you are farming an area, make sure to send monthly updates with solds, currently on the market and any other subdivision level information you have. I KNOW, this is hard, but hard is what will make you the big bucks. Sellers want to know that you are an expert in their area. If you don’t want to do this level of work, send out information about your entire market. 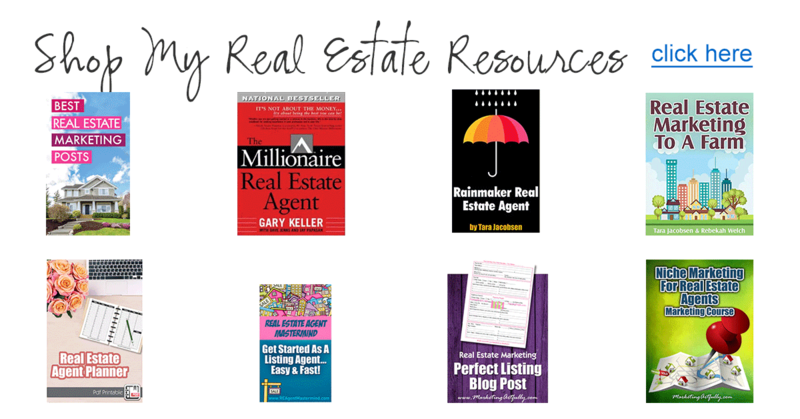 Your email database should be all about real estate. Do not send recipes or football game stats. Make sure you are sending great info about things that home buyers care about like decor trends, housing costs, and important upgrades to look for in a new home. Send out messages when you are doing open houses. Invite people to come by and visit you (even if they are not in the market for a new home). Having connections with people will lead to more business. Most of all, make sure that EVERY message you send has a call to action of “hit reply and let me know…” something. Sending out emails is mostly about getting people to talk to you, not just being a megaphone for your business. I know that some of these things sound knit-picky or stupid. But dealing with buyers and sellers are very different transactions and marketing for them should be too! 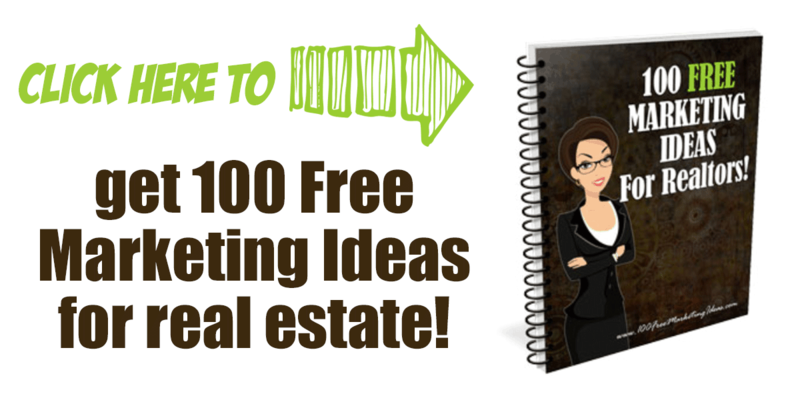 Niche Marketing For Real Estate Agents – A marketing mini course to help you with your marketing! How To Have A Great Open House – A reference guide detailing some specific open house strategies! Mostly I would just like you to start thinking about your Real Estate Marketing a little bit differently. Really focusing on whether you are targeting buyers or sellers and which you are better suited to do personally!